In the kitchen you can find complimentary coffee, tea, milk, sugar and buscuits. 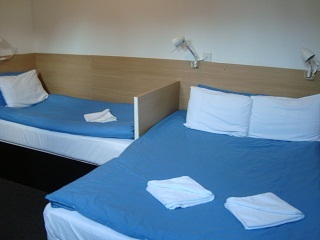 When you arrive at the hostel your bedroom will have been cleaned, tidied and of course the bed will have been made up. All our rooms have a comfortable bed with Orthopaedic Tufted Mattress, freshly laundered cotton sheets, duvet, two pillows and a bath and hand towels for each guest. In addition every room offers an en-suite shower room. All rooms are equipped with 24" / 26" Freeview LCD TVs, remote control, folding table, mirror, rail hook, hairdryer and have free Wi - Fi internet access. 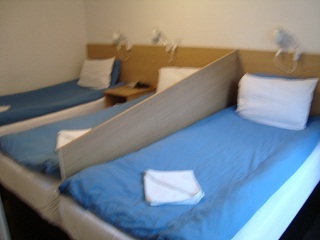 Bedroom sizes are different from 7.00 sq.m to 10.50 sq.m and due short of room do not consist wardrobe.